We bring forth an exceptional variety of Shirodhara Vessel that is manufactured from quality materials. These Shirodhara Vessels come with Brass Chains, Rings, hook and imported ball valve control or cotton wick. The Shirodhara Vessel manufactured, exported, and supplied by the company is offered at highly reasonable prices. We offer Shirodhara Pot/Yantra (Brass). A shallow brass pot with beautiful brass chains & 'S' hook to hang to a hook /stand for shirodhara oil treatments. Pot with oil capacity of 2 l is fitted with cotton wick for oil flow. Pot with hammer marks has a bright natural finish. Attractive looks. Easy to wash & clean. 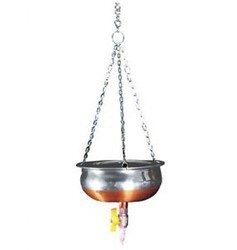 Shirodhara Yantra pot a shallow stainless steel pot with chains and hook to hang to a hook stand for shirodhara Oil treatments. It is fitted with Oil flow control valve mechanism. Features Innovative Wood Finish Design. - Elegant Look meet International features. - No smell or bubbles even after long use. - No oil leakage from Drain tap in locking position. - Fully controlled oil flow. No wastage of oil due to leakage. vessels come with Brass Chains, Rings, hook &imported ball valve control or cottonwick. A shallow Brass/coppar/s.steel pot with beautiful brass chains & 'S' hook to hang to a hook /stand for shirodhara oil treatments. Pot with Oil capacity of 2lit. is fitted with oil flow control valve mechanism. Pot with hammer marks has a bright natural finish.